At Skinpeccable, we help you do just that. The Skinpeccable skincare line has been specifically designed to help you obtain ultimate results, with a routine that will easily fit into your lifestyle. This powerful antioxidant/hydroxy acid combination exfoliates dull skin cells, firms skin, neutralizes free radicals, and clarifies and brightens the skin tone. CEGA 30 + Ferulic contain vitamin E ester, green tea, and the vitamin C ester, Tetrahexldecyl, the only stable form of vitamin C clinically proven to stimulate type 1 collagen. The addition of ferulic acid works as an antioxidant booster for the C & E to give you a more powerful antioxidant treatment. Salicylic acid also help lightly exfoliate dead skin cells for a smoother more even skin tone. CEGA 30 + Ferulic serum is most appropriate for most skin types. This potent combination of pharmaceutical-grade, topical vitamin A is a less irritating alternative to Retin-A®. The light silicone formula penetrates the outer layers of skin and works to repair and stimulate collagen and elastin, creating firmer, smoother, and softer skin. Retinol also increases cell turnover by stimulating cell production causing skin cells to slough off faster revealing brighter, healthier skin. Increased cell turnover can also be beneficial for acne sufferers, as the exfoliation unclogs pores and helps fade acne scars. Retinol EmoluGel is appropriate for most skin types. This non-acidic antioxidant treatment contains vitamin C ester, vitamin E ester and green tea. Our vitamin C ester, Tetrahexyldecyl, is the only stable form of vitamin C clinically proven to stimulate type 1 collagen. This powerful combination of antioxidants neutralizes free radicals and brightens and evens skin tone. C-mollient’s frangrance-free, preservative-free formula is so gentle that it can be used by acne, sensitive and rosacea skin types. C-mollient Gel’s light silicone base leaves skin with a smooth matte finish and is appropriate for most all skin types. Because of it’s non-acidic ingredients it is great for back bar and post procedure. These potent once-a-week pads are a great at-home chemical peel treatment. The powerful combination of 10% glycolic acid, 10% lactic acid and 5% salicylic acid exfoliates the dead skin cells, revealing healthier glowing skin as well as helping to reduce fine lines and even skin tone. The addition of the antioxidant, green tea reduces irritation, soothes skin and neutralizes free radicals. This quick drying solution comes in pre-saturated pads making it convenient for use on the face and body. This product is recommended once to twice a week. It can be used like a masque and rinsed off or kept on overnight. This potent antioxidant and peptide eye complex was designed to address the eye area’s specific needs. CEGA Eye Area contains DMAE, vitamin E ester, green tea and the vitamin C ester, Tetrahexlydecyl, the only stable form of vitamin C clinically proven to stimulate type1 collagen. This powerful combination of antioxidants also firms skin, neutralizes free radicals, and clarifies and brightens the area around the eye. The ester of malic acid helps exfoliate dead skin cells to reveal a brighter more even skin tone around the eye area. 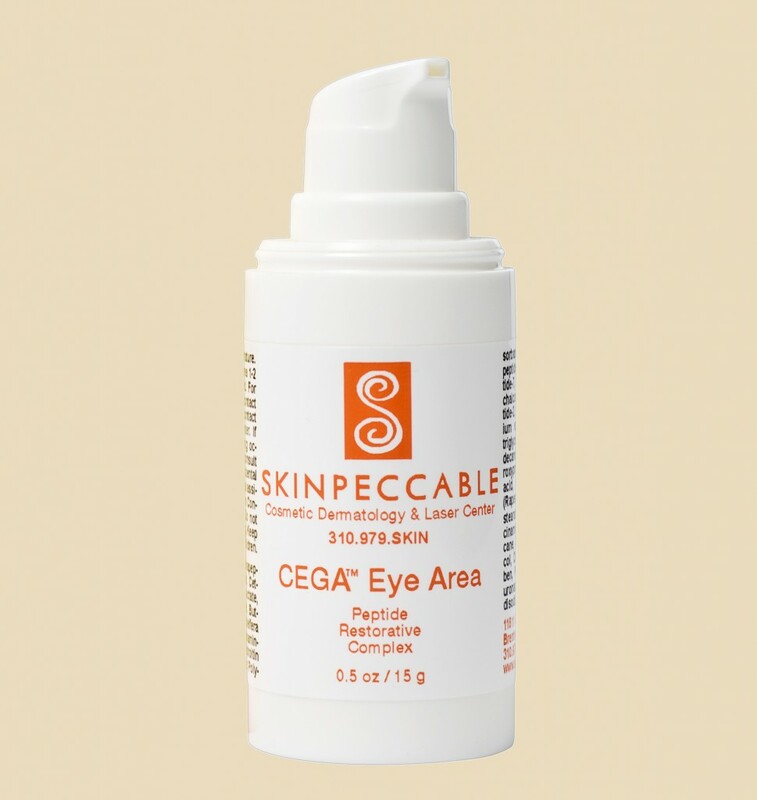 The peptide, Acetyl Hexapeptide-3 adds more smoothing power to CEGA eye by inhibiting the muscle contraction that can lead to wrinkles around the eye. This product is also a great companion product for Botox® users. This product can be used once to twice a day as tolerated. These convenient daily use pads contain a potent combination of hydroxy acids, green tea, and an anti-bacterial peptide. The combination of .5% salicylic, 1% glycolic and 1% lactic acid helps reduce oiliness and exfoliates dead skin cells that can clog pores. The peptide, kills the P-Acne bacteria that causes acne. The anti-oxidant properties of green tea neutralize free-radicals and sooth the skin. This quick drying solution comes in pre-saturated pads for use on the face and body. Multi HA Daily pads are recommended for daily use by oilier and acne skin types. This lightweight mattifying cream was designed for acne patients with dry skin. Theramoist contains both anti-inflammatory and anti-bacterial ingredients to help lessen the redness and inflammation of acne while moisturizing the skin. The silicone gel base leaves skin with a matte finish not shiny. Theramoist is appropriate for acne patients with dry and combinations skin types. This acne fighting gel combines Retinol and Salicylic Acid to help dry up active acne lesions and lessen future breakouts. Retinol is topical vitamin A which helps accelerate skin cell turnover to lessen skin cell cohesion, which can lead to clogged pores. Salicylic acid helps exfoliate dead surface skin cells and dry up active lesions. Retisal also contains anti-inflammatory and anti-bacterial ingredients to reduce inflammation and promote healing. This product is appropriate for acne patients and can be used every night or every other night (as tolerated by patient). Studies show that these reparative medical moisturizers help to restore the skin’s natural barrier. Barrier Replenishing Cream and Lotion contain lipids, cerimides and fatty acid which mimic the skin’s natural barrier function. The Barrier Replenishing formula has been clinically proven to replenish the skin’s barrier thereby relieving dryness, irritation and significantly reducing redness caused by this depletion. Both Cream and Lotion are appropriate for Normal to Dry skin types and can be used on sensitive or baby’s skin as well. Both are cosmetically elegant with the Barrier Replenishing Cream feeling slightly more emollient than it’s counter part, Barrier Replenishing lotion. This unique hyaluronic acid-based gel contains peptides, Niacinimide and Panthenol. The peptides, Palmitoyl oligopeptide and Palmitoyl tetrapeptide-7 mimick fragmented collagen. This tricks the skin into producing more collagen which results in firmer skin and less wrinkles. Hyaluronic is an effective hydrator that has the ability to bind 1000 times its weight in water, thus hydrating the skin and giving it a plumper appearance. Niacinamide and Panthenol are derivatives of vitamin B that work to increase levels of DNA repair enzymes. This powerful combination comes in a light fragrance-free serum appropriate for all skin types including sensitive, acne and rosacea. Hydrapeptide Gel is gentle enough to be used post procedure. This light-weight medicated cleansing foam combines 2% salicylic acid and glycolic acid with the antioxidant, green tea. This powerful combination helps fight acne and reduce blackheads without over-drying the skin. Mulit HA Foaming Cleanser is appropriate for Oily and Acne skin types. This silky, lightweight gel cleanser that cleanses and clarifies skin by combining antioxidants, vitamin C & E and green tea with the alpha hydroxy, lactic acid. This combination of antioxidants help brighten, and soothe skin while lactic acid helps exfoliate without drying. C-mollient Gel Cleanser is appropriate for normal to combination skin types including acne. Rosa Cleanse Cream and Foamy Cleansers were developed for sensitive patients prone to redness and irritation. These extra-gentle cleansers contain Evodiox a powerful redness-reducing agent derived from the Chinese Evodia rutaecarpa plant. This 100% fragrance free cleanser is gentle enough to be used on the most sensitive patient and is ideal for those with Rosacea. The creamy cleanser is most appropriate for dryer skin types and the foamy is most appropriate for combination to oily patients. This cosmetically elegant sunscreen contains Titanium Dioxide and Zinc Oxide for non-irritating, broad-spectrum protection. Formulated with melanin and Iron oxides. These 2 sunscreens provide chemical-free UVA and UVB protection without the “pasty white” appearance caused by most physical sunscreens. All contain the antioxidants melanin, Vitamin C, E, Green Tea and Ferulic Acid to neutralize skin damaging, free radicals. The fragrance-free, silicone base formula dries clear with a silky matte-finish and is perfect for all skin types. Melashade is appropriate for the normal to oily skin types. Melshade E is slightly more emollient and appropriate for the drier skin types. This cosmetically elegant sunscreen contains Titanium Dioxide and Zinc Oxide for non-irritating, broad-spectrum protection. Formulated with melanin and Iron oxides. This sunscreen provides chemical-free UVA and UVB protection without the “pasty white” appearance caused by most physical sunscreens. It contains antioxidants melanin, Vitamin C, E, Green Tea and Ferulic Acid to neutralize skin damaging, free radicals. The fragrance-free, silicone base formula dries clear with a silky matte-finish and is perfect for all skin types. The Antioxidant Soothing Balm Sunscreen is appropriate for post procedure patients or extrememly dry as it combines moisturizing petrolatum in it’s formula. This light weight moisturizing/soothing balm contains 0.7% Hydrocortisone in an emollient, silicone-elastomer gel base. It has the elegance of a cream with the purity of an ointment. The vehicle contains 10% Petrolatum combined with Cholesterol+Ceramide+Fatty acid barrier repair complex for enhanced moisturization. Ideal for post care of in-office peels, microdermabrasion and light, non-ablative laser treatments. 100% fragrance-free, preservative-free, and solvent-free. Studies show that this reparative medical moisturizer helps to restore the skin’s natural barrier. Moisturiche contains lipids, cerimides and fatty acids that compose the skin’s natural barrier function. All have been clinically proven that by replenishing this barrier, dryness, irritation and redness are significantly reduced. Moisturiche is fragrance free and appropriate for the drier skin types and is excellent for sensitive, and post procedure skin. Learn More About Skinpeccable Skincare Line Today!